The Sikh Times - Biographies - Inderjit Singh Reyat: Explosive Devotion! Inderjit Singh Reyat: Explosive Devotion! Inderjit Singh Reyat believes he did nothing wrong. The man who pleaded guilty yesterday to manslaughter in the deaths of 329 people in the 1985 Air-India bombing sleeps well at night. Experts who have assessed him while he was in jail said he is a quiet, religious man with no history of depression and no evidence of mental illness. He believes he is not responsible for what happened. 'In my [mind], I never ever hurt anyone in my life,' he said in a Globe and Mail interview a few years ago. A person who has known Mr. Reyat for several years said, 'He has the mind of an innocent man.' It's religion that drives him. Mr. Reyat did not intend or want to kill people, and his faith lets him feel he was not responsible for their deaths, the acquaintance said. Mr. Reyat was born in India in 1952 but it was in England where he embraced his faith. His family moved to England when he was 13. He was the most devout in the family, taking on the obligations of an observant Sikh at the age of 16, at a time when the rest of the country was going wild over the Beatles and the Rolling Stones. 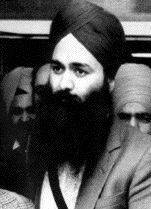 A few years later, he became part of a fervent Sikh religious group called Akhand Kirtani Jatha [A.K.J. ], which prays with drumming and hypnotic Sikh hymns that sometimes last as long as three days. He was also learning a trade. After completing high school, he started a five-year apprenticeship program. With his diploma, he got a job as a mechanic in Coventry at Jaguar Motor Car Co. In 1974, he married Satnam Kaur, a woman of Indian ancestry who was born in East Africa. Shortly afterward, they decided to move to Canada. He found work in Richmond, B.C., as an auto electrician for Auto Marine Electric and became a regular at the Sikh temple in Vancouver. He played drums and his wife sang hymns. He was reputed to be one of the best tabla (Indian drums) players in Vancouver. Working for Auto Marine, Mr. Reyat and his young family moved to Kamloops, and then in 1980 to the small Vancouver Island lumber town of Duncan, north of Victoria. He settled into a quiet life, with a son and three daughters and a good job. He was active in the local Sikh temple. Everything changed in the spring of 1985 when he started receiving phone calls from Talwinder Singh Parmar and others he had known from the Vancouver Sikh temple. Mr. Reyat knew Mr. Parmar as a Sikh priest, not as a militant. Mr. Reyat was not political, although he shared the views of others who endorsed violence as a response to a crackdown in India on insurgent Sikh separatists. Neither man realized that Canada's new spy agency, the Canadian Security Intelligence Service [C.S.I.S. ], was listening on the phone line when Mr. Parmar contacted Mr. Reyat in May of 1985. C.S.I.S. agents were also watching when Mr. Parmar came to Duncan two weeks before the Air-India bombing and went into the woods with Mr. Reyat to test some explosives. The R.C.M.P. identified Mr. Reyat as a person of interest within a month of the deadly blast on the Air-India flight and another explosion on the same day in Japan. He was arrested on Nov. 6, 1985, with four others, but he was charged only for having an unregistered revolver and possessing dynamite. The four others were not charged. Shortly after his conviction on those charges in 1986, he took his family back to Coventry, England. He believed police would continue to harass him and his family. He got a job once again at the Jaguar plant. It took Canadian authorities another 18 months before they asked Britain to send Mr. Reyat back to Canada to face manslaughter charges for the bomb blast in Japan. Police in Japan had discovered parts of a Sanyo tuner used in the bomb. The pieces had part of a serial number that led them to a store in Duncan, the same store where a tuner had been sold to someone who used Mr. Reyat's credit card. He was extradited in December of 1989, and, after 50 days in court, was convicted by a judge of manslaughter in the deaths of two baggage handlers at Japan's Narita airport. Four others were injured.